Can you dye your hair while pregnant? 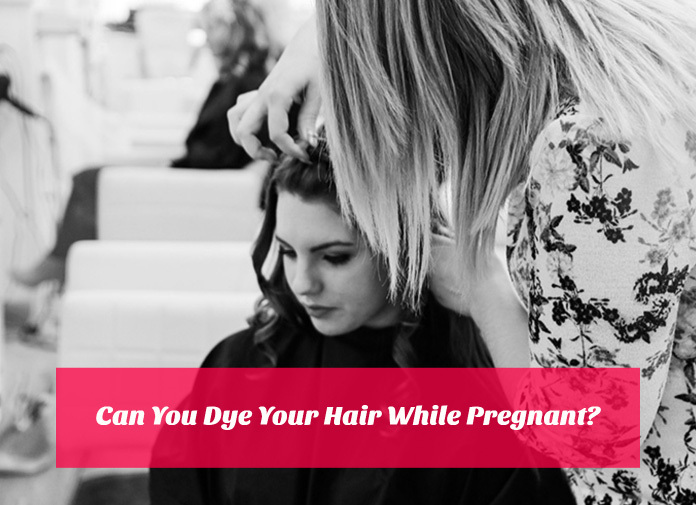 Many women face this question when they want to use hair dye during pregnancy. ???? Out of the limited ways to pamper yourself during pregnancy, hair color and highlights during pregnancy are the most tempting. And for some women, gray hair is nerve-wracking and add on to the list of miseries while pregnant. The idea of your body undergoing a transformation can cause anxiety. Getting a new hair color can lift up a pregnant woman’s mood. The question popping in your mind is a good sign that you are a concerned mother. Are Hair Dyes Safe While Pregnant? Yes, a pregnant woman dye hair during pregnancy. There is no danger to the fetus from the chemicals in the hair color. Nevertheless, you can take some precautions to minimize the risks as well as allergic reactions. Researchers haven’t been able to establish any relation between hair dye color and fetus health. It’s safe to assume that most branded hair colors are safe for human skin as well the baby in your belly. Moreover, most of the dye is applied on the hair and the amount applied on the scalp is too less. A minute amount of hair dye is absorbed by the skin, which means that you and your baby are completely safe! Since hair is dead protein, there are no chances of chemical entering the bloodstream. You may though get some allergic reactions from certain hair dyes so it’s always better to patch test on the inner elbow, let it dry and observe any adverse reactions. If you’re still hesitant and want to err on the side of caution, you may choose semi-permanent dye with fewer toxins. You can also opt for highlights which are considerably safer as hair dye is applied only along the length of the hair strands and not the scalp. Natural dyes such as Henna are still better and completely safe. A study showed that bleaching hair often can increase the risk of miscarriage in pregnant women. Those who work in parlors and are pregnant can have this complication. Exposure to the fumes that evolve from bleaching hair is not safe during pregnancy. Hair dyes having toxins or artificial hair coloring agents can cause side effects and allergic reactions. During pregnancy, hair texture changes and hair may react differently to the hair dye. Always, do a patch test and check the ingredients before applying hair color. The first trimester is most crucial for baby’s development. During this stage, your body undergoes great hormonal imbalance. The color and texture of hair can change due to this change and may revert back later. It is important to wait until the second trimester to get your hair dye. Any fumes or least exposure to chemicals can cause an early miscarriage. You can color your hair yourself using homemade hair dyes for pregnant women. Henna and coffee serve as natural and safest hair color during pregnancy. Beware of the vegetable dyes available in the market as they can have any chemical. It is best to make your own hair dye during pregnancy, using water and vegetable extracts. Applying your hair color will also make sure that you don’t allow any harsh chemicals to touch your scalp. Instead of coloring your hair completely during pregnancy, opt for highlights. In that case, you’ll be only getting hair color on your strands. Avoid root to tip treatments as they lead to extensive exposure. Hair highlights during pregnancy is a sort of patch test that stays final. You don’t allow the hair dye to come in contact with any tissue that can transfer the chemicals to blood. More than the hair color it is the fumes that are harmful during pregnancy. Women who are exposed to bleach fumes for over 40 hours a week during pregnancy are at high risk of miscarriage. Even when you are applying hair color at home, do it in an open space. Don’t go to overcrowded salons for hair treatments during pregnancy. The suffocation can make you uncomfortable and increase chances of exposure to toxic fumes. Hair treatments that involve long procedures or multiple sittings are not good for pregnant women. Even if you need to get your grays done often, avoid very long treatments. When you allow the hair color to stay for long, it starts moving into the skin layers. Wear gloves and be very particular of the safety instructions. During pregnancy every part of the body becomes sensitive. Not following the instructions can cause reactions or allergies. Do not use hair sprays for covering grays or hair relaxants during pregnancy frequently. These aerosols can enter your respiratory tract and cause problems. The harsh the hair treatment is, the less is its safety assured. You must avoid getting permanent hair colors during pregnancy. Permanent colors are very harsh for long-term action. Semi-permanent hair colors are a better choice. You can get hair color when you are pregnant more than once. That will still be safer than permanent dyes. Wash your scalp thoroughly after getting hair color during pregnancy. Bleach or going from blonde to dark hair requires a lot of salon treatments. Pregnancy is not the right time for such makeovers. This also includes the possibility of not being happy with the change and feeling depressed. During pregnancy, it is natural that you’ll change and cannot be totally like you were before it. You need to accept the fact and then decide on a suitable hair treatment. Try sticking to the similar shades of your natural hair color. During pregnancy, any infection can take longer to heal. Along with leg cramps, mood swings and back spasms during pregnancy you can’t afford to have another issue. You must prevent the hair color from touching any delicate regions. After completing the work clean yourself. Do not eat while getting a treatment because you may directly consume toxins. As mentioned above, you must avoid overcrowded parlors. More than popularity you need comfort and reliability right now. A beautician that deals with pregnant women will help you best. They will have the right cosmetics for you. The right parlor, attendant, and treatment will ensure the safety of hair color for a pregnant woman. No one can tell you what is right or wrong while you are expecting. You can read about the safety of hair color during pregnancy. The decision of getting hair highlights while pregnant or not is up to you. If doing so brings you out of pregnancy blues then you must do it. You can test the dye on some strands. Do not let the hair color sit on your head for too long. Next articleFertility Window: How To Calculate Your Fertile Days?